A grilled cheese sandwich seems like the simplest thing to make—it’s just bread and cheese, grilled—until you actually make one and you’re like, “that’s it?” and you realize a truly delicious grilled cheese sandwich requires some extra attention and methods you may not have considered. 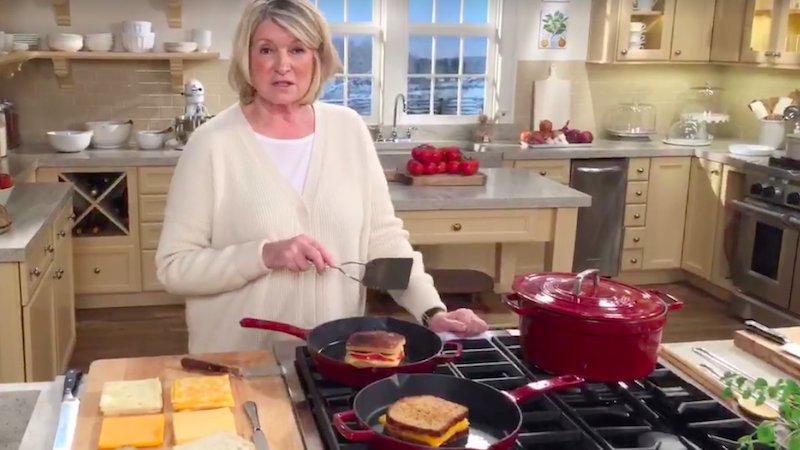 In a Facebook live video today, Martha Stewart made a pair of her favorite “comfort foods”: grilled cheese sandwiches and tomato soup. But as a grilled cheese lover, I’m much more concerned with how to enhance my skills in that area, especially when it comes to selecting surprise ingredients. For today, Martha prepared grilled cheese sandwiches for her team, including Kevin Sharkey, who has somehow never made a grilled cheese sandwich in his life. Martha makes his requested sandwich, which is packed with Gouda cheese, bacon, tomatoes and pickles on white bread. “These are lovely bakery breads, which we slice,” says Stewart, who prefers fresh bakery or homemade loafs. Be it whole wheat, brioche or country white, Martha says they’re “all good for a grilled cheese sandwich.” Indeed, I made a brioche grilled cheese for the first time this year and it was amazing. Between the bread, Martha puts tomatoes (without the skin), three slices of Gouda cheese, sweet hot pickles, bacon and Dijon mustard and “grills” it over a low flame in a cast iron pan. Here comes a simple yet major revelation if you’re me: Mayo on the outside of the bread, not butter, though Martha does later add some butter on the inside. Mayo, she says, is “supposedly fewer calories and very tasty and the bread doesn’t burn.” Since I’m not a regular cook, this is news to me. The butter vs. mayo argument of course ignites controversy in the comments section of her FB Live. But I’m going to go forth and make a grilled cheese with mayo, which may change my life. Here’s an official recipe from Martha.